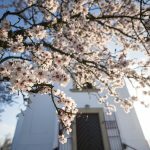 The winner of the Hungarian Tree of the Year competition—the almond tree in front of the Church of Our Lady on Havihegy in Pécs—is now one of the contestants of the European Tree of the Year contest. Online voting began this past Saturday. The nearly 135-year-old almond tree won the national Tree of the Year contest, organized by Ökotárs Foundation, with 4779 votes. It beat the trees in Budapest’s Római-part and the special giant oak tree in Szebény. Nominated by the Jurassic Nature and Tour Club, the plant will represent Hungary in the 2019 European Tree of the Year competition. The jury is looking for the tree with the most interesting story. Hungary has won the competition three times and come in second several times since its inception. Online voting began on the international website last weekend and will close on 28 February. The results will be announced at the Award Ceremony in Brussels on the 19th of March.